If you're boarding a cruise ship in Venice, the simplest way to get between the airport and the ship is to buy a transfer from your cruise line. This can be expensive, however, and many passengers resent having to pay hefty prices for a 20-minute ride by chartered coach. In this article, we'll tell you how to reach the cruise terminals on your own by bus or land taxi and by boat or water taxi. ABOVE: San Basilio (the smaller of Venice's two main cruise terminals) is next to a vaporetto stop. INSET BELOW: The quays at Marittima. Before deciding how to reach the cruise terminal, you'll need to know where your ship will be moored. Megaships and other large vessels of cruise lines such as Costa, MSC, Princess, and Holland America normally use the main Marittima terminal. Smaller ships often use San Basilio, especially on Saturdays at busy times of the year when Marittima may not have any vacant berths. If you're arriving in Venice by ship and need transportation to the airport, simply follow our directions in reverse. If you're arriving in Venice a day or two before your cruise, or if you're staying in Venice afterwards, you may find it convenient to book a hotel room near the Piazzale Roma instead of lugging your bags to another part of the city. 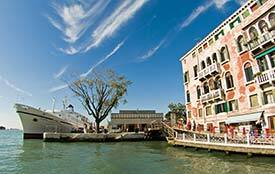 See Venice Cruise Terminal Hotels and Venice Airport Hotels for suggestions. Another option--which works especially well if you've got bulky luggage--is to stay in Mestre, on the Venetian mainland, and take a cab to your ship. For details, read our Venice Travel Blog post, "Mestre for Venice Cruise Passengers."